August 11, 2018, 12–3 p.m.
Young Cultural Stewards participating in a field trip at the Burnham Wildlife Corridor’s Gathering Space, La Ronda Parakata. Image courtesy of the Chicago Park District. 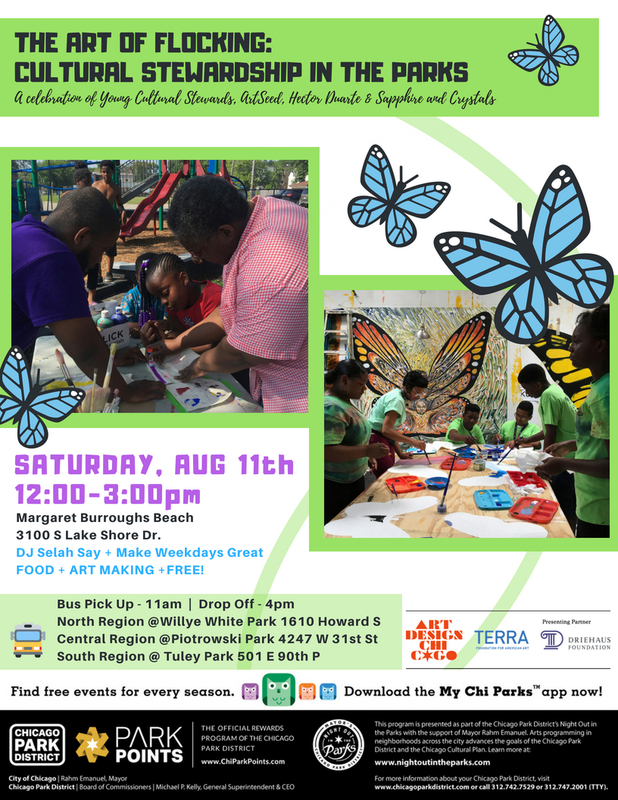 The Art of Flocking: Cultural Stewardship in the Parks is summer-long youth program celebrating Chicago’s community-based art practice. Join in a culminating celebration of the program to include live music and performance by DJ Selah Say and Make Weekdays Great, food, youth art-making activites, and a parade to La Ronda Parakata Gathering Space in the Burnham Wildlife Corridor led by artist Hector Duarte and members of the artist collective Sapphire and Crystals. Buses will be available for youth and families coming from each region of the city. Pick up locations include Willye White Park, Piotrowski Park, and Tuley Park at 11:00 am with drop off at 4:00 pm. Visit the link above for more details.